On Dec. 20th, I made a four-hour drive to the Minneapolis area for the First Annual Minnesota Sports Holiday Show. The even was being held at the Rosedale Mall in Roseville, MN and featured 13 autograph guests who have some association with the state of Minnesota. 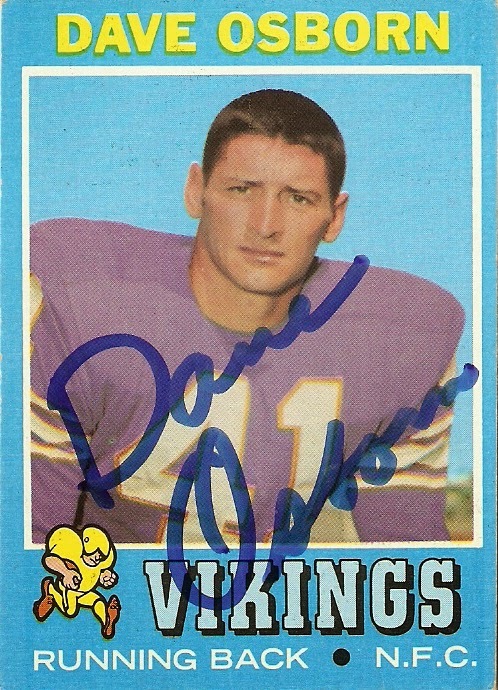 The biggest representation was for the Minnesota Vikings, who had 7 players represented at the event, including Dave Osborn, who signed this 1971 Topps card. Osborn not only has Minnesota connections, but North Dakota ones as well, as he played college football for the University of North Dakota. He was selected by Minnesota in the 13th round (176th overall) of the 1965 NFL draft. He played sparingly his rookie year, but found his busiest season to be 1967, when he ran for 972 yards on 215 carries, including one for 73 yards. He played 11 years for the Vikings before playing his final season in 1976 for the Green Bay Packers.